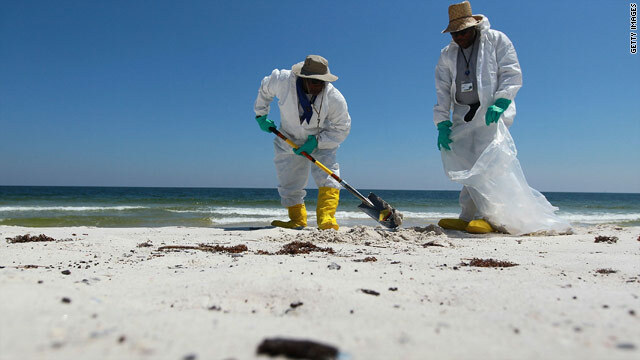 Workers clean up patches of oil Tuesday on the beach at Bon Secour National Wildlife Refuge in Gulf Shores, Alabama. (CNN) -- Oil spill cleanup is under way at many beaches along the Gulf Coast, and beach-bound travelers are keeping a close eye on coastal conditions. Small bits of tar were found at Henderson Beach State Park over the weekend, according to the Emerald Coast Convention and Visitors bureau. "These were easily removed, and no further oil has been spotted," said a post earlier this week on the bureau's website. The area, which includes Destin, Fort Walton Beach and Okaloosa Island, is urging travelers to visit. "Our white-sand beaches remain open and our emerald-green waters remain clear. In addition, offshore fishing is still going strong, with captains simply taking a more easterly course and reporting great success out on the water," the site said. Destin Mayor Sarah "Sam" Seevers told CNN that a few, small tar balls have come ashore this week but added that spotting occasional tar balls on the beach there is not unusual. "We may go five years and not see any tar balls, and then we'll see a few. That's just a way of life on the Gulf of Mexico, Seevers said. Beachgoers are in the water as usual, she said. The water at Pensacola Beach is open Wednesday for swimming and fishing, according to the Pensacola Bay Area Convention and Visitors Bureau. The National Park Service reported heavier oiling at Perdido Key on Tuesday afternoon. A health advisory has been issued for beaches stretching from the Florida-Alabama line to the entrance of Johnson Beach on Perdido Key, the visitors bureau website said. Swimming and fishing in the affected waters are not advised. Mike McHugh, an iReport contributor, shot video over the weekend at Johnson Beach. "I came back to Johnson's Beach to see how the cleanup was progressing and to see what high tide brought in. At 4:30 p.m., the cleanup crews were gone. There were less tar balls, but still [they] are easy to find," he wrote. James Amerson, another iReporter, has been tracking the oil in Pensacola. Tar balls were found late last week on Pensacola Beach, ranging in size from 2 to 3 inches up to 18 inches, Amerson said. "Strange to think this stuff, millions of years old, came from several thousand feet underground and floated over a 100 miles until it came to rest [on] our sugar white sands," Amerson wrote on iReport.com. The visitors bureau urges beachgoers to take precautions. "According to [the National Oceanic and Atmospheric Administration], tar balls do not pose a health risk to the average person, but visitors are advised not to pick them up," the website said. All of the Gulf Islands National Seashore sites are open, according to the National Park Service website. On Tuesday, the park service reported light to moderate oil occurrences at Horn and Petit Bois islands in Mississippi and Fort Pickens and the Santa Rosa area in Florida, with heavier oiling at Perdido Key. Cleanup crews continue to work in those areas. Health departments in both states urge people to avoid swimming in areas affected by the oil spill. In Alabama, the Department of Public Health has issued an advisory against swimming in waters off Gulf Shores, Orange Beach and Fort Morgan or in bay waters close to Fort Morgan. The beaches remain open. The pier at Gulf State Park in Gulf Shores is closed to fishing but open for sightseeing, according to the Alabama Gulf Coast Convention and Visitors Bureau. The Alabama Department of Conservation and Natural Resources have closed state Gulf waters and some inshore waters to fishing. Oil is affecting more than 45 miles of Louisiana coast, according to a state emergency website. Grand Isle has closed its public beach, according to the Cajun Coast Visitors and Convention Bureau website. Natasha Combs, an iReporter, visited Grand Isle over the weekend to observe cleanup efforts. "The beach was empty with the exception of the workers and the military. All of the cleanup crew were wearing [hazmat] suits. Bags of oil were gathered in piles along the beach, and workers were rinsing oil off of themselves in small plastic kid pools," Combs said.